After yesterday’s neutralized team time trial, today’s stage represented the first real day of racing in this year’s Vuelta. But, atypically as far as Grand Tours usually go, it was not a day for the sprinters. Finishing on a category 3 climb that offered gradients in excess of 15%, but with only four and a half kilometres of serious climbing in the endgame, it was a hard stage to call. But call it I had tried to do, and yesterday I named Sagan for the win. Not everyone at Marmeladrome had shared my faith in the Slovak, and better picks had been made: Dan Martin looked like a good shout for Cannonade-Garmin, and Valverde, who can kick well at the summit, also seemed a good bet. As it turned out, Sagan was not to feature at all, so allow me to publicly eat my words and my hat. Sagan didn’t feature at all because he was caught in the day’s big crash, an impossible-to-account-for mess which punched a hole clean through the peloton at 30km to go; it looked like they’d been hit by a mortar, and there were bikes and bodies everywhere. Lesser crashes have been neutralized (consider this year’s Tour de France), which says something about the Vuelta organizers. Several strong riders were downed and slow to get up, and a few left the race in ambulances. The big drama of the crash was embodied by fiery Sicilian Vincenzo Nibali. Nibali hasn’t been up to his Tour de France-winning form this year and has much to prove; hitting the deck hard and losing time on stage 2 was unlikely to have featured in his race plan. Nibali rode hard with a few other stragglers before somehow ditching the lot to return to the peloton. Somehow? Well, it turns out that he might have got a little help from one of the stickiest bottles we’ve seen (the clip’s here). He also spent enough time behind team cars to earn a fine, not to mention monoxide poisoning. But, by the final climb, he was practically leading the pack for a bit. It was a strong ride, but it remains to be seen how the judges viewed his methodology. 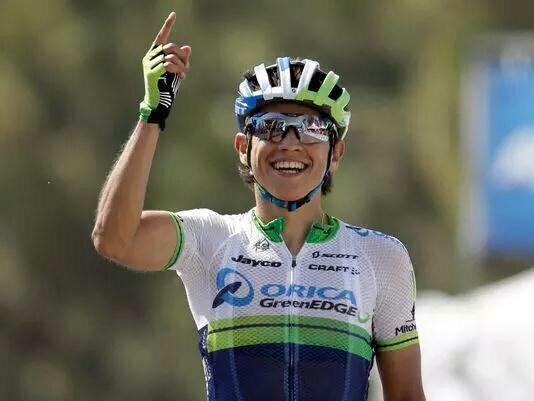 However, strongest of all was Esteban Chaves. The lilliputian Colombian (it seems it’s become necessary for commentators to roll out the word ‘diminutive’ whenever he or Pozzovivo do anything at all, so try that adjective on for size) shot out of the bunch within the final kilometres of the final climb and made his way over to the then-leading group, which included Tom Dumoulin and Nairo Quintana. Dan Martin looked good for a while, but was ultimately outfoxed once more, and on a day that had his name written all over it. Chaves made the bridge look effortless, turning a big gear with ease and tapping out a steady, even rhythm on the pedals. Actually distancing Quintana by a small amount (and the rest of the peloton by a large margin), only Dumoulin could match Chaves, and Dumoulin did not look comfortable. Though Tom held the wheel well, Chaves knew the stage was his; he rose out of the saddle after the last bend and punched the air — a well-deserved win for one of the coolest characters in the peloton. I’m looking forward to Orica’s Backstage Pass celebrating this one, and with tomorrow a sprint stage we could see Caleb Ewan trying to do an OGE double like in previous Grand Tours. Will Chaves, though, rise up as a G.C contender, or fade in the later weeks and longer climbs? Perhaps the most notable thing about today’s stage, though, wasn’t the battles between teams, but those within them. Without clearly defined team leaders, both Astana and Movistar are at risk of some in-fighting — though this has, in the past, benefitted some teams. Nibali fought hard to tag back on to the peloton and displayed real power by getting to the front on the climb — but was he trying to beat his G.C rivals, or sending a warning to Fabio Aru, who is rumoured to be team captain this year? And as for Movistar, is Valverde the only person who believes he is on a team with two captains? It seems Quintana’s early, and entirely unexpected, dig on the final climb today might have been an effort to get an early edge over Valverde (who sent his own message by taking intermediate sprint points), thus securing his role as team leader. Only Sky looked like they were able to relax today, allowing Nicholas Roche to go up the road with the Quintana-Chaves group in the endgame. Froome lost only four seconds to Quintana, and it will only benefit the Brits down the road if Nico is also a G.C threat. At this rate we’re in for a vicious first week of the Vuelta, especially if riders continue to fight against their own team mates. Breaking News: Since we published this piece, it has transpired that Nibali’s sticky bottle was just too sticky for the referees. Compounding the drama of the day, he has been kicked out of this year’s Vuelta. Thanks to our contributor @Jamvelo for keeping us abreast of this story.